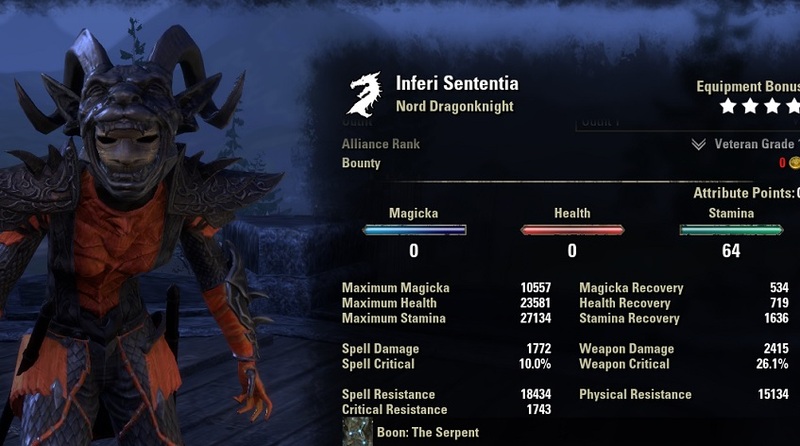 Welcome to the Stamina Dragonknight Build PvP “Berserker” for Elder Scrolls Online. 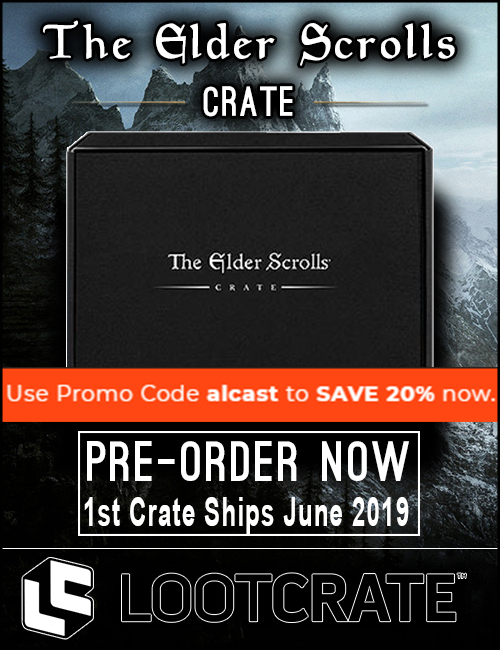 Make sure to bookmark the link as I will keep updating the build for each new Update of ESO. 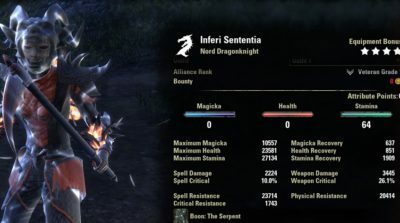 The Stamina Dragonknight Build PvP “Berserker” is optimized for Battlegrounds but also works in Cyrodiil. This is a medium armor bleed focused build, it has a lot of offensive stats and can also be very tanky if you combine the right buffs for a brief duration. We have a very DoT focused setup with a lot of AoE burst damage. We are using Deadly Strike and The Master's Axe to increase our poisons and bleed DoT damage. In addition to that we have Blood Spawn Monster Set to increase our ultimate regen and resistances during combat and Hide of the Werewolf is only active on the backbar to increase our ultimate regen even further which again will increase our overall sustain! Build was added in the Wrathstone DLC. We are running 1 stamina recovery glyph with the Serpent Mundus Stone and Dubious Camoran Throne (or the gold food) to reach 1900 stamina recovery with Major Endurance which we get from our Tri-Stat Potions. Tri Stat potions are VERY essential to the build, you want to use them in tight situations where you drop low on health and or magicka. 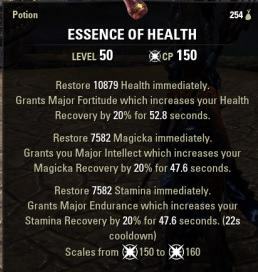 Magicka is a very important tool for this build also. We have 10,5k Magicka, which is not a lot so we need to be careful on how to use it. However, using Tri-Stat potions and the Battle Roar passive make it possible to regain quite some Magicka from time to time, so we can keep using our Magicka support abilities. Helping Hands also helps us regain resources on a regular basis, this usually procs when we use Fossilize to stun our enemies. Because we are using Blood Spawn and Hide of the Werewolf we also regain Ultimate faster than usual, which again will make us proc the Battle Roar passive more often to regain resources, that is also why I recommend being a Nord because the Ultimate regen will be even higher. Unbuffed: Out of combat, no buffs. Buffed: Weapon Damage Enchantment, Rally, Volatile Armor, Tri Stat Potion were active when I took the Screenshot. Note: Keep in mind, I had purple armor and jewelry but gold weapons. If you want a more max resources based setup, you can also replace the Deadly Strikes set with Shacklebreaker! 511 Setup: We are using a 511 setup, our Helmet is heavy and the Shoulder light armor, the rest is medium armor. No Master Weapons? If you do not have any Master Weapons, you could also use the Spectral Cloak which can be obtained from normal Blackrose Prison Arena. Or you can also use Hide of the Werewolf Axes on the frontbar. Quick Cloak: Needs to be up a 100% of the time, gives you 25% AoE damage mitigation and also gives a short speed buff at the start which can be nice if you have to run far. It also deals decent damage to enemies. Rending Slashes: This deals an insane amount of damage, especially when combined with the Master’s Dualwield weapons, always apply this to the enemy. You could also use Blood Craze if you want. Venomous Claw: Another strong DoT that you want to apply to the enemy, the skill is very cheap but deals a lot of damage. Steel Tornado: Your main AoE spammable ability. 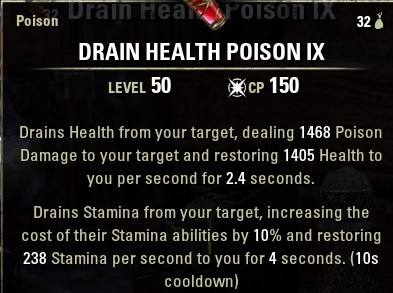 When an enemy drops low on health this is your execute ability, because of the passives from Dual Wield it deals a lot more damage in execute. Resolving Vigor: You have to keep this up during combat, this is your main heal. If you do not keep up your heal you will die. Take Flight: This is your main ultimate, it has high burst damage and also restores resources all the time because of the Battle Roar passive from Dragonknights! Take Flight in combination with Steel Tornado is a lot of AoE damage and will kill most enemies. Rally: This is your heal over time and if needed, you can reapply it early to gain a burst heal. Noxious Breath: Another DoT that you should place on the enemy. Damage of the ability is not that high, but you also apply Major Fracture, decreasing enemies physical resistance by 5280 which will make all your other abilities deal a lot more damage. Volatile Armor: Has to be up all the time, gives you a huge resistance buff and also increases your overall incoming healing due to the passives of the skill tree. Reflective Plate: if you are snared or you face ranged enemies, make sure to keep this up as much as possible. Just be careful, you only have a limited magicka pool! Fossilize: This is your main stun tool, it stuns and roots enemies, the stun goes through dodge roll or block, it is one of the best CC tools in the game. 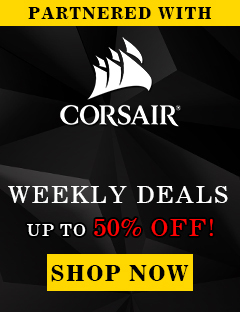 Keep in mind, this also costs magicka so you have to be careful with your magicka pool! Carve can also be nice to use because it once again increases your ultimate regen and therefore your overall sustain. 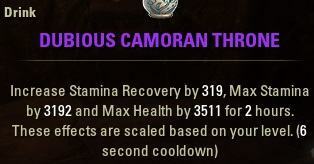 You can either run Dubious Camoran Throne or the slightly more expensive version Artaeum Takeaway Brooth. Both work for the setup. 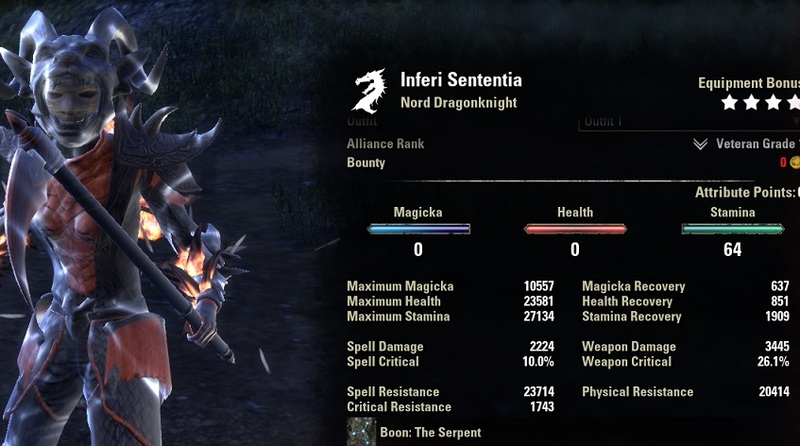 I highly recommed being a Nord because of the extra 3960 physical and spell resistance, ultimate regen 5 ulti every 10 seconds, 1500 max stamina and 1000 max health on top of more cold resistance. Other races also work but are not optimal. Werewolf? If you want you can also use Werewolf form with this setup.